Freshii is one of the fastest-growing food-to-go brands in the world, serving a healthy and customizable menu built around fresh ingredients. Since opening its first store in the US in 2005, Freshii has grown to over 300 outlets located across 85 cities in 20 countries. In 2016, the brand partnered with Applegreen to open its third outlet in Dublin, and now has plans to double its restaurant numbers in Ireland from six to at least 12 in the first six months of 2017, including its for outlet in Northern Ireland. Speaking to Ireland’s Forecourt & Convenience Retailer, master franchise holder Dave O’Donoghue explained how he became involved in bringing the concept to the Irish market. “My background was with Cuisine De France where I worked for some 20 years,” he said. “It was acquired in 2000, and I became managing director in 2004, leading to a period of fantastic growth. Dave explained his last few years with the company involved developing the European side of the business, but after 20 years he wanted to do something else. Dave explained that it was a key trend which developed during the recession that inspired him. According to Dave, he had learned from his post on the continent that there was “nothing ahead of the curve” in Europe – and that meant a trip to the US was in the offing. “We toured the whole country, and knew exactly what we were looking for,” he said. “We wanted something four or five years ahead of the Irish market. “We found Freshii in Chicago in the basement of a Macy’s outlet. We hopped on a plane and arranged a meeting with the CEO Matthew Corrin. Dave described Matthew as a “real, true entrepreneur” in the style of a Mark Zuckerberg of food. “This was a millennial attraction and a millennial brand, all built from the consumer up,” he said. 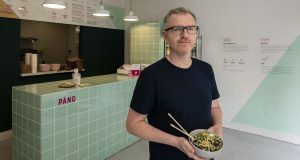 Dave said he was taken by the concept and by its potential, but one question remained – would Irish people actually eat it? Dave added that Freshii’s menu is one of the few that is designed entirely by a professional nutritionist. Dave signed up to be master franchise holder in March 2015 and launched their first Dublin store in The CHQ Building in the city centre. “We opened in August and never looked back,” Dave said. A major social media campaign followed, as did new store openings in Mespil Road, and Trinity College. A meeting with Applegreen COO Joe Barrett, however, pushed the concept into new territory. Since then, Freshii has been inundated with franchise applications, and Dave reveals that over 500 have been filed. Speaking about his plans for the future, Dave explains the success with Freshii is just getting started.